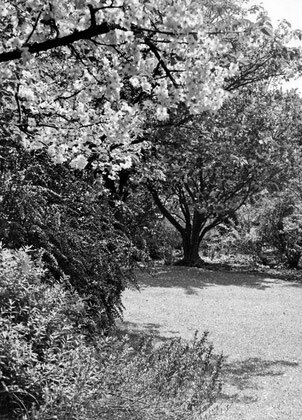 After the war Collingwood Ingram's book Ornamental Cherries (1948) made his name in the gardening world. 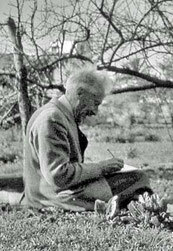 He contributed frequently to gardening journals, to Country Life and The Field on birds and plants, and continued to develop his garden in Benenden. He was a familiar figure at Royal Horticultural Society shows, still travelled widely and recorded his travels in journals and sketchbooks. He published two volumes of reminiscences, In Search of Birds and A Garden of Memories. 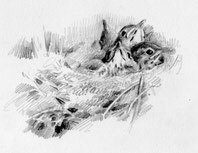 In his 90s he published The Migration of the Swallow and, privately, a booklet Random Thoughts on Bird Life. His contribution to gardening was much wider than ornamental cherries. He bred new cultivars of Rhododendron and Cistus, produced the well-known Rubus X tridel 'Benenden', and his rosemary 'Benenden Blue'. collected in Corsica, is widely grown. A momento of his 1927 South African collecting trip was a hybrid gladiolus known as Homoglad 'General Smutz' and a deep blue Omphalodes is named after him. For his contribution to horticulture he was awarded both the Victoria and Veitch medals of the Royal Horticultural Society. 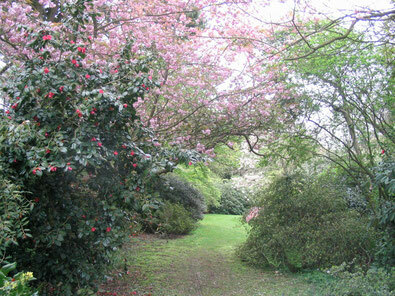 he had many gardening disciples, including, famously, Lady Anne Palmer (now Berry) creator of the garden at Rosemoor. Botanists at Kew produced a detailed plan of the garden and its plants for his 100th birthday in 1980. The garden at The Grange is still sympathetically maintained and contains some fine plants, including a few old flowering cherries, but sadly the passage of years has depleted it of many of the cherries. Part of The Grange garden in 2008. Collingwood Ingram's influence remains strong in the natural look of its woodland glades.